Successfully Added Sensor, application support, night vision, two-way audio, hd video, 2x18650 battery to your Shopping Cart. It's easy to track who's using this video doorbell. The doorbell itself is simple to install and can be used with your iOS or Android phone and tablet. That's why, even if you're not there, you can always notice who's at your door. Using a 1/4 inch CMOS sensor, this video doorbell allows you to see hd video at 720p. It has a 140-degree wide Angle lens so you can see what's going on in front of the door. The doorbell has an 18650 x2 battery and ultra-low power design. With two-way audio support, the doorbell can easily communicate with the person who rang it. 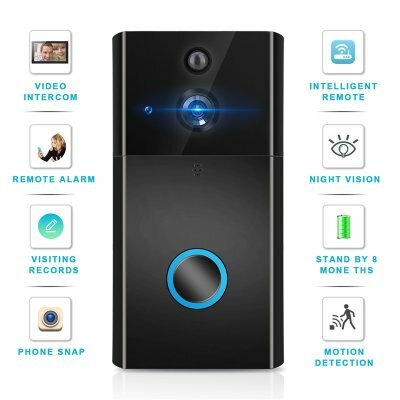 Intelligent video doorbell supports audio calls to video. With its night vision support, you will be able to use this smart home accessory day and night. With a remote unlock function, this smart doorbell allows you to easily open doors for visitors without having to stand up from a chair. If you're looking for an advanced doorbell that is both safe and convenient, this gadget is what you've been looking for. Ultra-low power consumption, charge a time to use about 3 months, standby for 8 months.